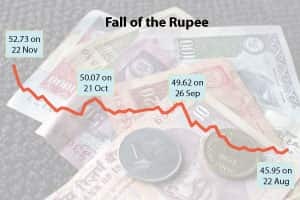 Mumbai/New Delhi: The rupee plumbed new depths on Tuesday, overwhelmed by a relentless scramble for dollars that policymakers blamed on global market dynamics, deepening domestic economic concerns, and leaving investors and importers guessing where the floor lies for a currency that looks increasingly vulnerable. The rupee, the worst performer among Asian currencies this year, closed 0.3% lower at 52.32 per dollar, a fresh closing low, after falling to a record of 52.73 in intra-day trading. The currency, which has lost 17% from the year’s high reached at the end of July, had ended on Monday at 52.16. The BSE benchmark Sensex snapped an eight-day losing streak by gaining 0.75% on Tuesday to 16,065.42 points, helping the currency recoup some of its losses. The rupee also tracked the euro’s gains, said N.S. Venkatesh, treasurer at IDBI Bank Ltd, noting that 20% of Indian exports are to the euro zone. Reports that the Reserve Bank of India (RBI) will open a special window for oil companies to buy dollars from, instead of burdening the forex markets, strengthened the rupee towards the close of trade, dealers said. The window will be opened to oil companies on a case-to-case basis, the report said. A weaker rupee drives up the cost of imports—including oil, which accounts for about one-third of India’s import bill—aggravating troublesome inflation that’s close to double digits even after 13 interest rate hikes since March 2010, and worsening a growing current account deficit. It also strains Indian companies that didn’t forsee such a sharp swing and failed to hedge their dollar exposure. The value of oil imports grew 20% in the last fiscal on expanding demand; the current account deficit is expected to be around 3% of gross domestic product in the current fiscal year compared with 2.7% for the previous year. Demand for dollars from oil companies and other importers has fuelled the rupee depreciation, exacerbated by a flight of risk-averse investors from emerging markets and a scramble from the euro to the greenback. “The exchange rate that we have seen over the last couple of weeks, particularly in the last three-four days, is driven by the global dynamics," RBI governor D. Subbarao told reporters in Hyderabad. To what extent the rupee moves and in which direction will depend on a credible resolution of external problems, particularly the sovereign debt problem in the euro zone, Subbarao said. “Our policy is that if the macroeconomic situation is impacted due to the exchange rate fluctuation or undue volatility we will have to intervene," he said. “We are yet to decide whether to intervene or not at the moment." RBI, which usually intervenes to curb excess exchange rate volatility, has been—outwardly at least—reluctant to step in and support the rupee, adding to a sense that the falling currency may be a one-way bet. The central bank was suspected of selling dollars at around 51.79 on Monday, but the selling pressure on the rupee was too strong, traders said. Finance minister Pranab Mukherjee said that RBI intervention wouldn’t help. Subir Gokarn, a deputy governor at RBI, had said last week the central bank would be careful about using foreign exchange reserves aggressively to protect the rupee’s depreciation..
“We don’t really have a target or a rate in mind (at which to intervene)," Gokarn said on Tuesday. “It’s moving as per market dynamics. It is disruptive, there is no question. There (will be) impact on our import bill, particularly for energy. It’s having an impact on companies and it is a problem." Companies are anxious. Attracted by lower interest rates abroad, Indian companies have raised about $30 billion of foreign debt this year, which will cost $5.4 billion more to repay because of the rupee’s unanticipated fall, according to SMC Global Securities Ltd. Large companies generally hedge their currency exposure, but few expected the rupee to breach 50 to the dollar, said SMC strategist Jagannadham Thunuguntla. From fertilizer firms to car makers, Indian companies have begun to count the cost of the falling rupee. The Indian Farmers Fertiliser Cooperative Ltd wants a $36 a tonne reduction in the price of potash, $50 a tonne cut for di-ammonium phosphate and $45 a tonne decrease for complex nutrients, managing director U.S. Awasthi said, as the slide of the rupee makes nutrients more expensive. Auto companies including the local units of General Motors Co. and Toyota Motor Corp. said they are mulling price hikes to offset the rising cost of component imports. Gold imports by India may drop 15% in the fourth quarter to 170 tonnes from 200 tonnes in the preceding three months as the rupee’s fall to a record drives up domestic prices, Rajesh Exports Ltd chairman Rajesh Mehta said. That may help cool a 19% increase in bullion prices this year. Economists and market analysts are guessing how low the rupee can fall and how long it will stay there. “I will not be surprised if the rupee breaches the 53 level and stays there for some time. I don’t see a pullback till external macro conditions change," said N. Bhanumurthy, economist with National Institute of Public Finance and Policy in New Delhi. Sebastian Barbe, head of emerging FX and fixed income strategy at Credit Agricole SA, in Paris, said: “I think INR (Indian rupee) has the potential to depreciate to 54 in the short term, but in the meantime, RBI may smooth the depreciation." Swati Bhat works with Reuters and Erika Kinetz with AP. Prateek Parija of Bloomberg, and PTI contributed to this story.